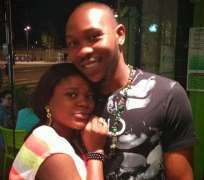 Abami Eda's last born, Seun Kuti, who, obviously, is matching on his late dad's career has put his dancer, Yetunde George in family way. Old news you would say. Recent event, however, has shown that Seun means well for his pregnant girlfriend as we gathered that the girl is now rocking Paris. She was said to have been in Paris for a few months after she discovered that her tummy was protruded and she left Nigeria when her pregnancy became more obvious. Yetunde who couldn't attend the 2013 Felabration in Nigeria, was spotted at the on-going one in Paris looking heavily pregnant. As you can see, she is due to put to bed in a couple of months' time. From this stable, we wish her safest delivery!.